Despite a complex managerial position, Mozilla continues its activities. 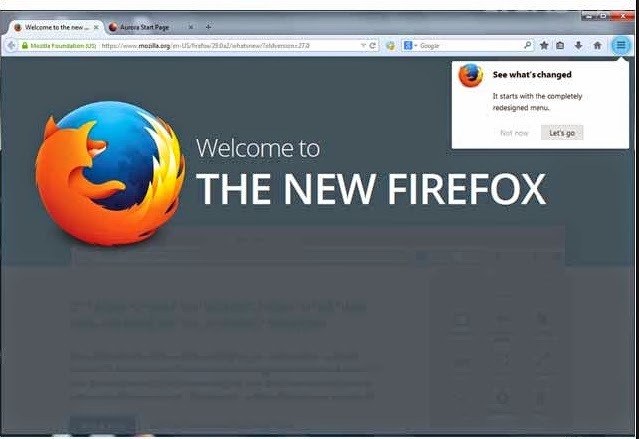 After given beta, Mozilla Firefox 29 web browser available now. Focus on what's new. Firefox is still the third preferred by users, behind Google Chrome and Internet Explorer web browser. In March, the browser reached 20.4% market share. Virtually unchanged since December 2013 when it stood at 20.6%, Firefox is a slight steady decline for a year, at which time it reached 22.1% market share. While Mozilla Corporation has just welcomed a new interim CEO, Chris Beard, activities continue at the same pace. After proposed in March in beta, Firefox 29 is now available for all. Among the new interface has been redesigned. Called Australis, it is particularly stark. A new menu is available at the top right and brings together different tools (print, save, etc..). Also, the tabs are now more rounded and the active one is more visible to attract attention. The interface has also been designed to be customizable and adapt to the needs and habits of users. Firefox 29 Firefox syncs easily between multiple devices. By creating an account Firefox, the information contained on multiple devices can be synchronized. Download Firefox 29 directly or via automatic updates browser.